To many connoisseurs the personal coffee recipe is a very special philosophy. 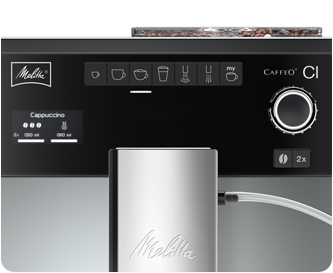 The CAFFEO® CI® easily adapts to the individual preferences of up to four users: Thanks to the "My Coffee" function, coffee strength, temperature, coffee amount, milk and milk froth quantity as well as other parameters for any coffee specialty can be easily saved in the personal profile and retrieved upon request. As a special extra the CAFFEO® CI® prepares even two cups of all specialties at the push of a button - if you wish to enjoy coffee pleasure for two. The coffee recipe is for many connoisseurs an own philosophy. You are not willing to set your personal coffee preferences at every brewing? No problem! With the "My Coffee Memory" function you can individually preset your favorite coffee specialties. 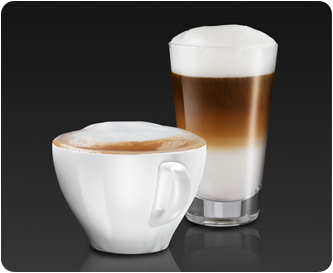 Whether a strong espresso or a marvellous frothy Latte Macchiato - the CAFFEO® CI® remembers every taste! Up to 4 persons can preset and safe each coffee specialty for their personal taste, so that they can enjoy their favorite specialty at any time. CAPPUCCINO: A strong Espresso will be topped by a "hood" of creamy milk froth - original like in Italy! Only in this way is the light brown crema to be seen at the side of the frothed milk topping. LATTE MACCHIATO: Hot milk and milk froth are poured into the glass first. Then an Espresso is added which creates a dark layer between the milk and the milk froth giving this specialty its characteristic look. 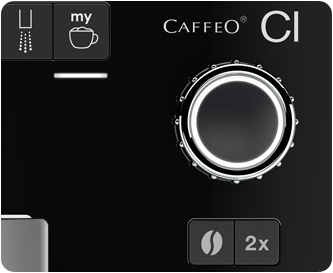 CAFFEO® CI® prepares all coffee specialties at the push of a button even for 2 glasses/cups at the same time. 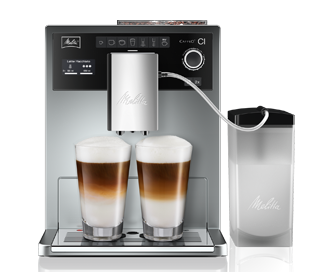 Enjoy the preparation of Latte Macchiato and Cappuccino completely without moving your cups. For the perfect preparation of various coffee specialties, the CAFFEO® CI® is equipped with the two-chamber bean container "Bean Select". No matter whether a Café Crème in the morning or an Espresso after dinner: coffee lovers can choose easily before prepartion e.g. between mild coffee beans or strong espresso beans. With the integrated ground coffee chute there is also the possibility of using pre-ground coffee. Due to the simple menu navigation the handling is very easy and intuitive. The illuminated control buttons ("Illuminated Control") indicate the operating options. The Rotary Switch allows you an easy navigation through the menu. 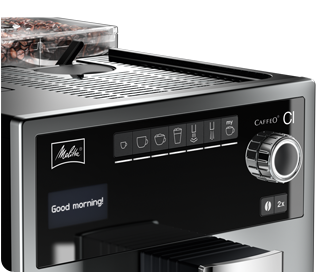 The text display supports with clear instructions - from coffee preparation to the automatic cleaning programme. 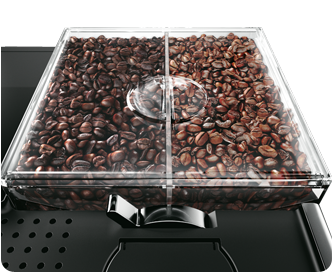 The milk system of the CAFFEO® CI® guarantees optimal hygiene for perfect coffee indulgence. Among the automatic cleaning programmes of CAFFEO® CI®, you can completely remove the milk unit and clean it manually or in the dishwasher. Besides the CAFFEO® CI® is equipped with a 1l milk container* fitting in every refrigerator, so that you can always prepare specialities with fresh milk. The CAFFEO® CI® has only one outlet for all coffee specialties. It is steplessly adjustable and suitable for all sizes of cups/glasses up to 140mm height. 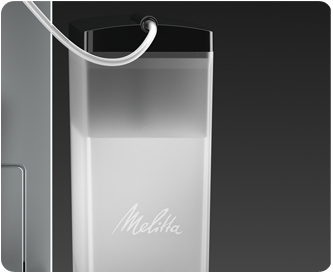 Thanks to the milk unit integrated in the spout, you don't need to move the cups/glasses anymore during preparation. A special feature is the LED cup illumination to put your beverages always perfectly in the spotlight. Thanks to the "Easy Cleaning" programme, the milk system is cleaned quickly and hygienically. The parts of the machine getting in contact with milk are rinsed with hot water and cleaned with hot steam afterwards. "Easy Cleaning" can always be done if wished or needed - CAFFEO® CI® reminds you automatically after every milk preparation, too. The CAFFEO® CI® does not only attract with elegant design and sophisticated technique, but also with high energy efficiency. 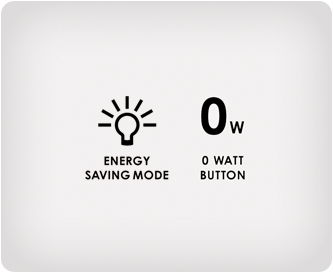 Equipped with "Auto-OFF" function, "0 watt button" and "Energy-saving mode" the energy consumption is getting reduced to a minimum. That protects your wallet and the environment. 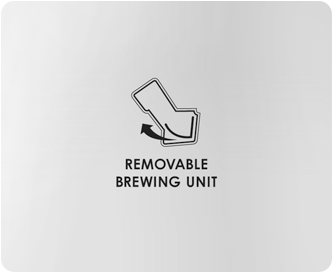 The removable brewing unit guarantees always perfect coffee indulgence. It is easily removable and you can rinse it under running water. So, there cannot remain coffee deposits to influence negatively the taste of your coffee. 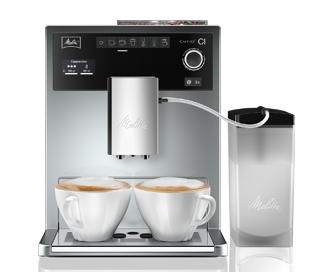 The CAFFEO® CI® can be operated with the Melitta® Claris® water filter. 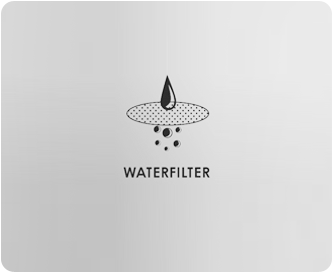 With such a filter your water gets always freshly filtered before preparation and guarantees pure and optimal coffee pleasure. Additionally the CAFFEO® CI® gets protected against calcification. The quality of CAFFEO® CI® was tested by HanseControl and awarded with the grade 1.7 (very good).